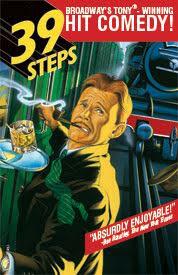 A show suitable for any age, 39 STEPS is a comedic spoof on the classic 1935 film. The hero of the play, the dashing Richard Hannay, must race to solve the mystery of 39 Steps and clear his name! The Tony® Winning Hit Comedy features just 4 talented actors in 150 different roles! “ABSURDLY ENJOYABLE! Theater at its finest!” ––Ben Brantley, New York Times. “THE MOST ENTERTAINING SHOW ON BROADWAY” ––Liz Smith, New York Post. To receive the exclusive discount on tickets use ASF;s special code LSP88. The offer is valid on all performances through 11/30/2015. $59 Tickets* Fri/Sat/Sun performances (reg. $89). To apply this exclusive rate to your order, visit Ticketmaster.com/THE-39-STEPS-NY-tickets/artist/2089037 then select a performance date & enter the code: LSP88. You can also call Ticketmaster at 800-250-2929 and mention the code. Or, simply print this page and bring it to the Union Square Theatre Box Office at 100 East 17th St.
Don’t forget to enter our online sweepstakes for a chance to win TWO FREE TICKETS. Learn how to enter here. This entry was posted in ASF Events, Associate Events, Uncategorized and tagged 39 Steps, American Scottish Foundation, Broadway, Special Offer, Union Square Theatre on July 30, 2015 by Theresa Schilling. Excitement builds at the Otter Valley Union’s Walking Stick Theatre Company. Young performers from Vermont’s Otter Valley Union High School are preparing for their international debut at the Edinburgh Festival Fringe. The students will perform “Anon(ymous),” a 90-minute modern adaptation of Homer’s Odyssey written by Naomi Iizuka. 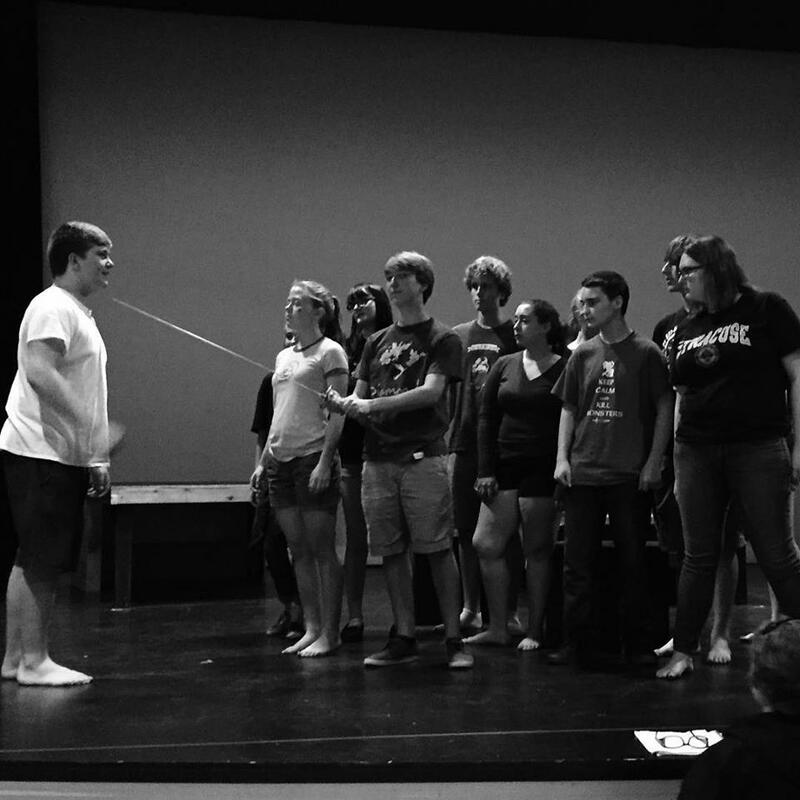 Otter Valley’s acting troupe is one of only a few dozen high school theater companies who will perform at the Fringe. The application process was only one obstacle the group would face. Funding the $6,500 per student cost of the trip proved to be a huge challenge. But the support that they recieved, from both their local community and beyond, was staggering. The American-Scottish Foundation heard of Otter Valley’s once-in-a-lifetime opportunity and immediately wanted to lend support. The Foundation gave Otter Valley’s Theater program a bursary grant to help make their potential trip to Edinburgh a reality. ASF’s involvement with Otter Valley only continued from there. Chairman Alan Bain invited Jeff Hull and his family to New York City so they could march in the annual Tartan Day Parade. The Hull family had a wonderful time at the NYTD Parade, where they were able to meet “Outlander” star Graham McTavish, as well as the ASF officials. Alan Bain got in touch with Scottish contacts, ensuring that the American-Scottish Foundation Bursary award could help enhance the students’ Scottish adventure. 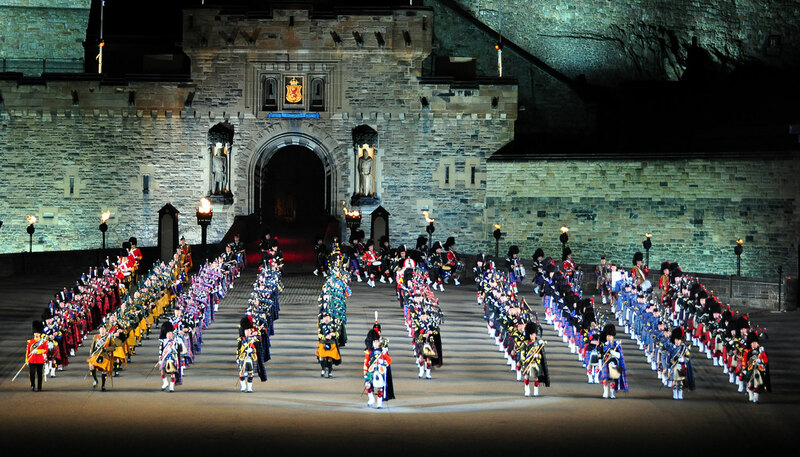 The students will be able to tour Edinburgh Castle, visit parts of Edinburgh’s Underground City, and purchase tickets to shows. The students will also enjoy a farewell dinner at the acclaimed Royal Overseas League. 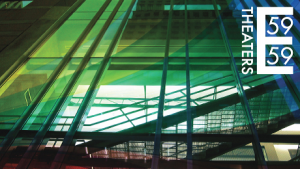 To learn more about the ASF Bursary program visit this page. 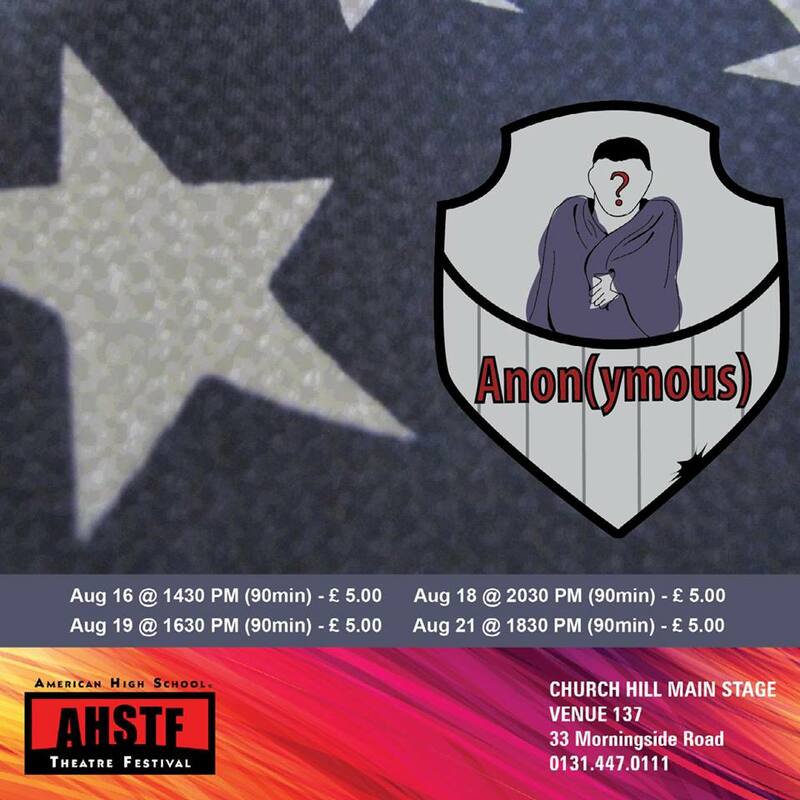 This entry was posted in Associate Events, News, Travel in Scotland and tagged American Scottish Foundation, Anon(ymous), Edinburgh Festival Fringe, Lord Malcolm Douglas Hamilton Bursaries, Naomi Iizuka, Otter Valley Union High School, Vermont, Walking Stick Theatre Company on July 30, 2015 by Theresa Schilling. If you can’t make it to Edinburgh for the Festival Fringe, have a taste of the exciting performances in New York City. 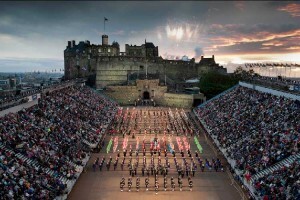 Every August since 1947, the city of Edinburgh has played host to a festival celebrating the arts. 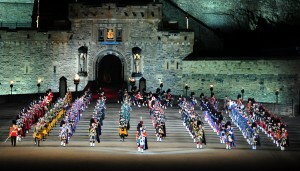 Today this festival, known as the Edinburgh Festival Fringe, is the biggest arts festival in the world. 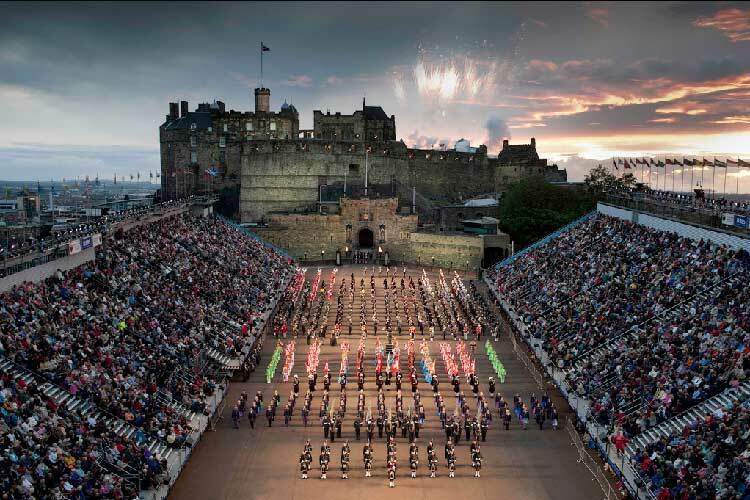 Visitors from all over the world flock to Scotland’s capital every summer in order to view dramatic performances, listen to music, attend exhibits, and wander the lively, crowded streets. Before the festival even begins, the 59E59 Theater company is hosting a preview of the Fringe fun. 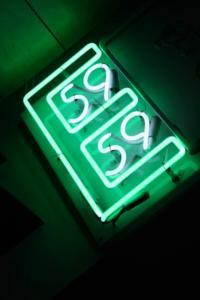 59E59 is an off-Broadway theater complex which hosts the East to Edinburgh Festival every year. This festival gives audiences an opportunity to preview the American acts being taken over to Scotland, and performers an opportunity to practice their acts before a live audience. Learn more about the East to Edinburgh Festival and the acts here. 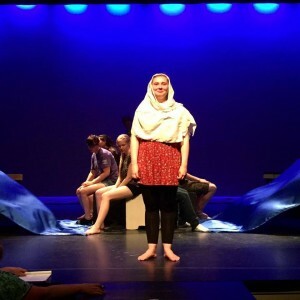 This entry was posted in Associate Events and tagged 59E59 Theater, Bettie Davis Ain't For Sissies, Bug Bite, Derby Day, East to Edinburgh, Edinburgh Festival Fringe, Ferdinand, Raft, These Troubled Times, Trans Scripts on July 22, 2015 by Theresa Schilling. 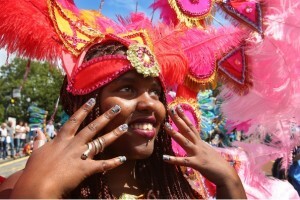 On Sunday, July 19, the fourth annual Edinburgh Festival Carnival took to the streets, drawing a crowd of over 20,000. 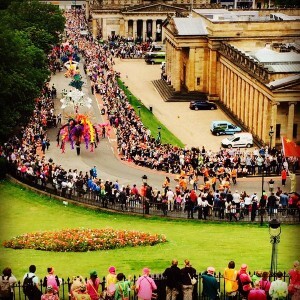 The parade performers hailing from Edinburgh include Edinburgh Samba School, Chinese Dragon, Brass Gumbo and Pulse of the Place — but those involved in the festival were not only from Scotland. There were dancers from Capetown, acrobats from Zambia, drummers from Holland, circus acts from Serbia, and more. 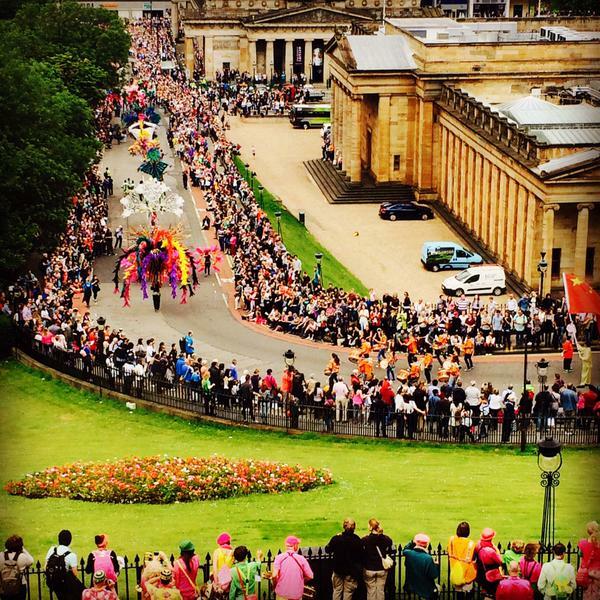 A total of 700 performers started at The Mound and danced through the city, despite a downpour of Scottish rain. 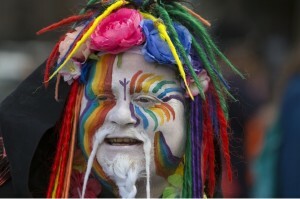 The Edinburgh Festival Carnival was originally set up in 1978 by Mike Hart, a Scottish banjo-player and guitarist. At first, the festival consisted of traditional jazz acts performed at free events in pubs. Over the years, events grew into large, ticketed affairs and the music began to include other genres. Today, many international guests attend and perform at the Edinburgh Jazz and Blues Festival. The musical festivities will continue until July 26. To see a complete timetable of the festival’s performances, visit their official website. To view more photographs from the festival, visit the STV Edinburgh article here. 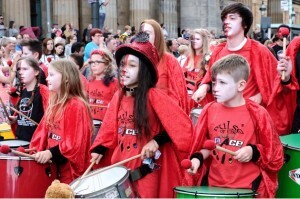 This entry was posted in Associate Events, Travel in Scotland and tagged Brass Gumbo, Chinese Dragon, Edinburgh Festival Carnival, Edinburgh Jazz and Blues Festival, Edinburgh Samba School, Mike Hart, Pulse of the Place on July 22, 2015 by Theresa Schilling.